A sunny Easter Sunday and after the morning exercises and meditation at the swimming pool terrace Mareike and Alexander are enjoying some Acroyoga postures. This meditative practice brings together acrobatics and yoga. Meanwhile, as you can see the pool is not yet completely full while I am still working on the ultraviolet disinfection system, but we have been swimming already anyway. The water temperature is 20 degrees now. 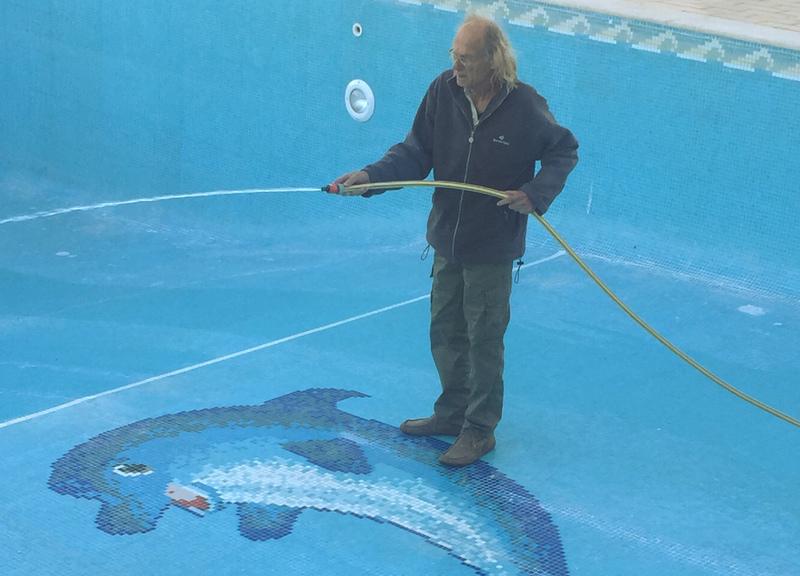 It took some weeks to repair the many mosaic tiles that had come off the walls but now the pool is ready to be filled again and here I am giving it a last cleaning*. Pool water needs to be monitored and keeping it clean can be a challenge, especially when you want to avoid using chemicals. We are installing alternative disinfection methods, so even dolphins will love to swim here. It also helps a lot when we clean our bodies well, before taking a dive. 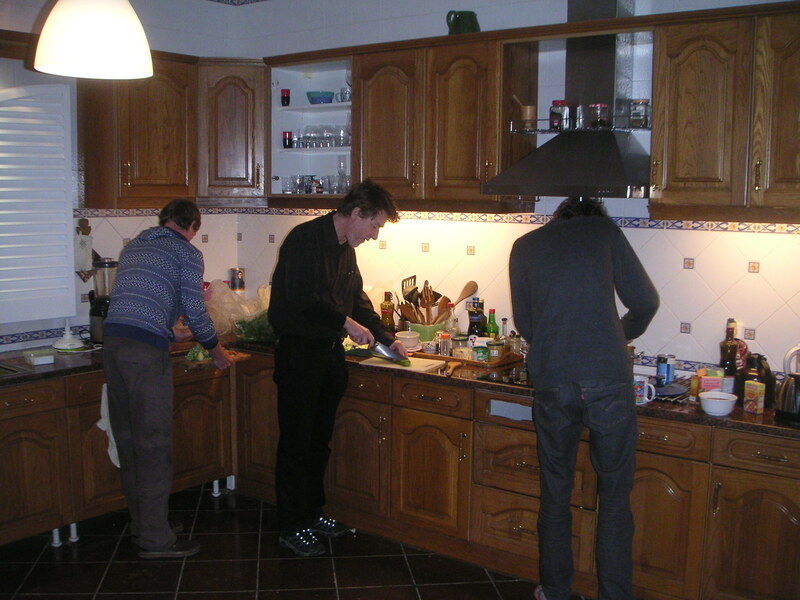 There is a large kitchen in our new place and not just one but three dedicated cooks were preparing a tasty and healthy dinner tonight. I call them our A-Team, after the popular 1980’s TV-series, because their names are Aiden, Anders and Alexander. They are from Ireland, Sweden and The Netherlands respectively. And behind the camera team member number 4, yours truly Señor Armin, as Pujari’s birth name is pronounced by the locals. We are still finishing the renovation and decoration of Laozi house, our new property in the Algarve, but spring has come and we also need to prepare a vegetable garden. Much needs to be done as the area was full of rubbish and weeds from years of neglect. In this picture Iris and Rozalie from the Netherlands, brandishing brushcutters, or roçadoras as they are called here. We can offer accommodation to a few volunteer workers in our garden from now on.